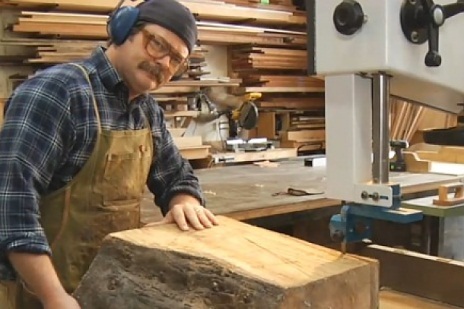 "Parks and Recreation" star Nick Offerman hard at work in his woodshop. Celebrities in woodworking is a no-brainer. After all, stars have always been known to get bored doing what they are paid eight figure salaries to do and start looking for a side project. And for most, that is what they use woodworking for: a pet project to fill time. But for others, woodworking is as important as their lucrative day jobs. One of the more famous 'rags to riches' stories in Hollywood is how Harrison Ford got into the business of show. For a while, Ford couldn't pay the bills by acting (crazy, right? ), so he turned to carpentry for a steady income. Even crazier, he realized he was quite good at his professional detour. His accomplishments included working for rock band the Doors as a stagehand and then building cabinets for soon-to-be "Star Wars" director George Lucas. It doesn't take a rocket scientist to figure out how the latter worked out for him. Woodwork as a road to stardom, who knew? Other stars almost got taken off the path to fame due to their woodworking passion. While he showed promise as an actor, two time Oscar winner Daniel Day-Lewis wanted to be a cabinet maker, going so far as to study it in school. He even applied for a 5-year cabinetry apprenticeship, but 'lack of experience' got in the way. Not all stars knew of their woodworking love before they achieved fame. Actor William H. Macy is a well-known 'Johnny-come-lately' to the trade, getting into woodturning only a few years ago. Since then, he's been on the cover of Woodturning Basics and has mocked the warped wooden bowls he's turned on several talk shows. Another Johnny with the last name Depp was expected to show up at the AWFS Fair in Las Vegas, shopping at General Tools booth - security rampd up, but he was a no-show. Probably the poster child for woodwork in Hollywood is "Parks and Recreation" funnyman Nick Offerman. Though he makes his bones in acting, Offerman emphatically calls woodwork his true love. The guy even has his own shop in L.A., where he and his six employees (two of which bear the Offerman name) pride themselves for their usage of fallen or salvage trunk for their projects. Items they make include slabs, canoes and even wooden mustache combs. While some stars got their hands dirty in the shop, other stars just oversee the production of furniture. Stars like Brad Pitt, Sofia Vergara and even Prince Charles have lines of furniture or cabinetry in the Prince's case.